Here are 4 more of our brilliant speakers for #igniteLDN7 on 15th November 2012. Don’t forget that details about tickets are available here. Data Visualization as user interface? Makoto will be looking back at these visualisations and proposes a future of data visualisation. Michael is a Canadian living in London. He really enjoys to cook, eat and take pictures of food. Michael spoke at Ignite London 5 about London’s hyped-up fear of gun crime, now he’s back to look at the media’s relationship with another bogieman – terrorism. How did gas become clean? Pete is interested in exploring the lobbying that has been going on around gas. 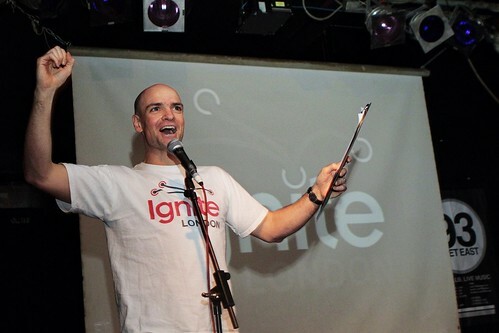 We had a fantastic response to our call for speakers; it’s been tough to make the final selection for Ignite London 7! Thanks so much to everyone who took the time and effort to put in a proposal. Here are 5 of our brilliant speakers for #igniteLDN7 on 15th November 2012. Caroline passionate about experimenting and pushing the boundaries of her own knowledge, shes a technology lover and has also been known to write for national newspapers in Scotland. Chris is a technologist who makes things, mainly on the internet, sometimes on tablets, occasionally with a 3D printer. Drew is a a teacher at a girls school North West of london; was a volunteer during the Olympics and is (genuinely) regarded to have been the worst contestant ever to have been on 15 to 1. Eva is scientist by training, and works for a scientific publisher. She is also a violinist and a writer. Eva has some amazing stories about dead composers’ scientific achievements. She will be talking about three composers and their scientific accomplishments: Edward Elgar, William Herschel, and Alexander Borodin. Whilst we are finalising the speaker line up we are happy to announce details of how you can get tickets for Ignite London 7 at 93 Feet East on 15th November 2012. Tickets are free and only guarantees admission for one person until 19:30. After this point we reserve the right to let other eager people in who have waited or tried their luck at the door. Tickets have previously sold out really quickly (record time of 5 minutes for the IgnitLDN6! ), we have decided to continue releasing them in 3 batches to give everyone a fair chance of nabbing one. We will announce each batch release again closer to the time to help remind you. Tickets are limited so please only take one if you are able to attend. Previous events have shown ticket holders not informing us if they would be unable to make it. This meant that hundreds of people on the waitlist were unable to have a chance of attending in their place. This makes us grumpy. And you don’t want that. To ensure a happy Ignite London Committee do let us know if you are unable to attend please inform us as soon as possible you can either login to Eventbrite and view your ticket to click the ‘cancel order’ button. Otherwise you can email via tickets@ignitelondon.net, thus allowing us to redistribute the ticket to someone able to use it. Get your speed fingers ready. Good luck and we look forward to seeing you at Ignite London 7.